The Monster Hunter movie has officially kicked off production. Hollywood's latest attempt to satisfyingly adapt a video game for the big screen is now underway and one of its stars, Milla Jovovich, seems rather excited about the prospect of what lies ahead. 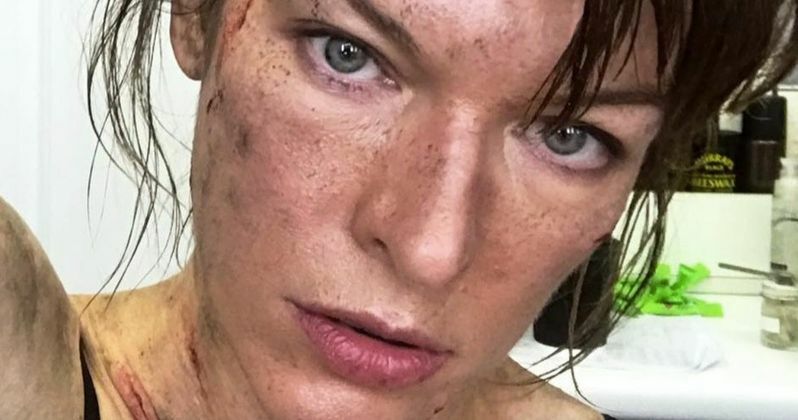 The actress has shared the first set photo which, in itself, doesn't reveal too much, other than the fact that Jovovich will once again be playing a badass. The Resident Evil franchise star is no stranger to strong female characters and video game adaptations. And she's also no stranger to the makeup chair. As she reveals in this first set of photos, her character will suffer her fair share of scrapes and bruises, which means lots of time in the makeup trailer, which is where these first photos from the set were taken. Here's what Milla Jovovich had to say in the caption she provided with her photos, which the actress shared on Instagram. "First day of filming on #monsterhuntermovie based on the epic game #monsterhunterworld! As you can see, my character is glamorous as usual! Here's the make up progression by the awesome kerry_skelton_ from beginning of dirt/wounds, to the finished product. I've been training for this day since February, so definitely excited to start production! #rangersleadtheway #strongwomen #capetowndiary"
For the time being, not a lot has been revealed about Monster Hunter. The video game itself is quite simple. It mostly revolves around players leveling up characters and slaying giant, really cool monsters. Capcom, the company behind the video game, recently revealed a little bit of what to expect, saying that the movie tells the story of two heroes who come from different worlds to defeat a shared danger; the powerful, deadly and magnificent monsters that inhabit the land. They also promise that the movie will feature familiar faces and beloved characters from the games, specifically citing the Admiral. It took some time to get this movie going, as we first reported that it was being worked on in November 2016. Since then, updates on its status have been minimal, until now. Aside from Milla Jovovich, Tony Jaa, rapper-turned-actor T.I. and Ron Perlman have been cast in the adaptation, though the nature of their roles has yet to be specified. The movie is to be directed by Paul W.S. Anderson, who helmed the bulk of the Resident Evil movies and once again teams up with Milla Jovovich. In addition to working with one another frequently, Anderson and Jovovich are married in real life. Hopefully, this won't suffer the same fate as previously video game movies. Paul W.S. Anderson, in the eyes of many, never made a great adaptation, but he made some entertaining ones. Maybe with this particular endeavor, entertaining will be enough. Monster Hunter doesn't currently have a release date set. We'll be sure to keep you posted as more details on the project are made available. Be sure to check out the first set photo from Milla Jovovich's Instagram for yourself below.